Exquisite large blue-flash Labradorite cabochon pendant in a 925 sterling silver mount. A-Grade blue flash. 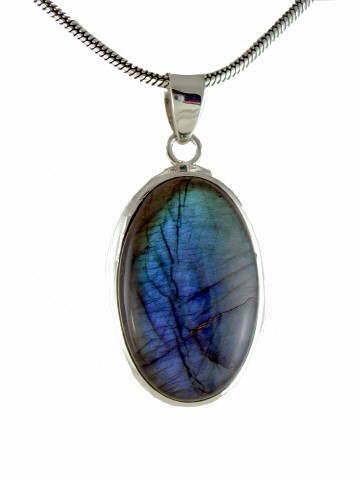 On first inspection, if viewed from the wrong angle, Labradorite can appear dull, grey and lifeless. Turn it gently in your hand and it springs to life with the mineral kingdom equivalent of a firework display, exhibiting a range of fiery, intense flashes, from blues and violets through, sometimes, to more unusual greens, yellows and oranges. Labradorite, from the Feldspar group of minerals, takes its name from where it was first discovered; Labrador in Canada. It is also known as Spectrolite.